Who said you have to have meat to have protein? I feel like the “where do you get your protein?” question is becoming almost comedic these days, as so many of us of all dietary labels are trying to eat more plant-y foods, and we know good and well (thank you, internet) that there are plenty of ways to cut down on meat without becoming protein deficient. My annoyance has transformed into giggles now when I see the commercials for milk or those snack wrap things, so desperately pushing that you might die of a protein deficiency were it not for eating all the animals. Especially of late, I’ll be the last person to label myself a vegan or vegetarian. I’ve satisfied a couple summer cravings for a good burger or a really delicious grilled chicken wing, but I’ve also been taking much more careful inventory than usual of what I eat. I preach balance all day long, but with the hot weather sapping all my energy, I’ve been curious: am I really getting a balanced range of protein, iron, calcium, and those million and one (or maybe just 26-ish) letter vitamins? Plus leaving room for a few treats? One of my biggest revelations in tracking what I eat is that empty calories add up. Perhaps it’s easier for athletes with a bigger daily calorie allowance, but most of the time I’m doing yoga or going for walks, with a little light lifting thrown in. Not your biggest calorie burner. So if I’m aiming to take in around, say, 2000 calories in a day, then every meal matters. It might not kill my waistline, or even my energy level, to have a homemade breakfast sandwich, but, that’s like a third of my calories for the day that I could upgrade by swapping it out for a smoothie and fruit. Even though the breakfast sandwich boasts a decent amount of protein and tastes AMAZING, it might also rank high on refined flour, fat, and sodium. As hard as it can be, that’s the thought process I’m trying to focus on when planning meals. For instance, instead of popping that bag of salt and vinegar chips in the pantry, right now I’m snacking on some raw veggies (not my thing at all) made palatable by a mixture of tahini and a generous squirt of Frank’s. 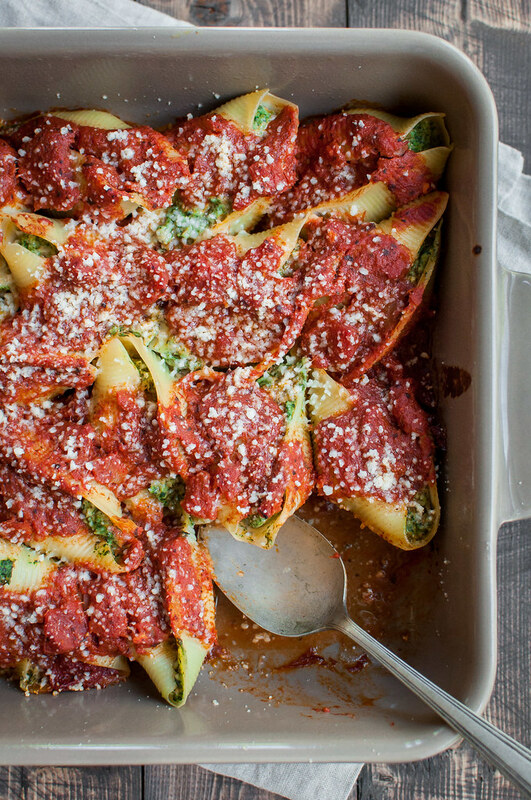 By now, maybe you’re wondering how a recipe for stuffed shells can possibly abide by this principle. 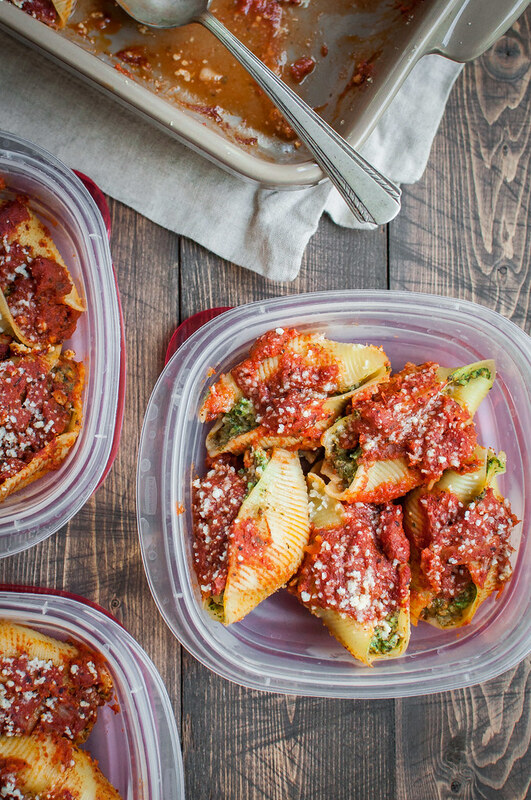 First, I guarantee you’ll eat less pasta in a portion of even six stuffed shells than you would if it was spaghetti for dinner. 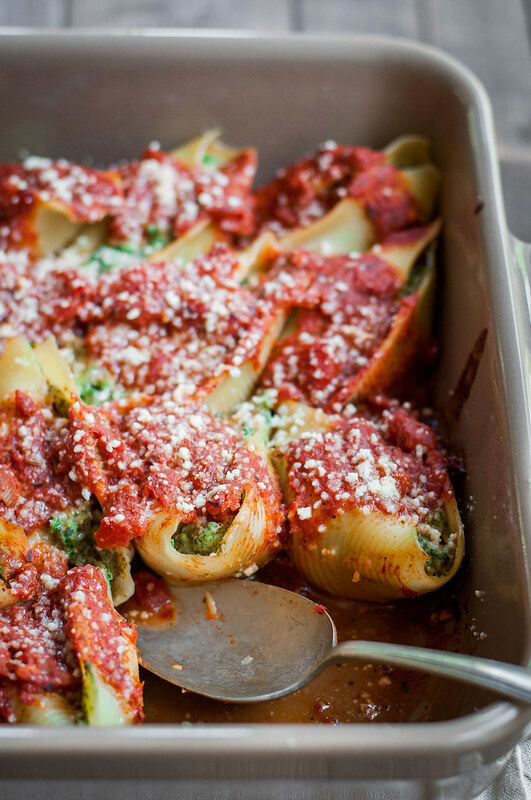 Next, instead of a more traditional ricotta/meat/sauce combo, the filling for these shells gets bulk from white beans that you can’t even taste (making you more likely to eat four than six for dinner). 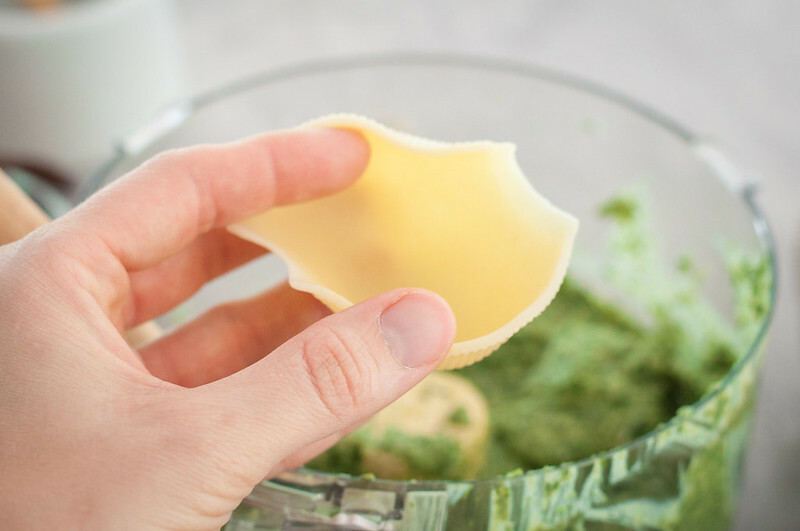 We’re going green with the filling, adding plenty of brightly colored spinach (or greens of your choice), and finally, instead of dumping in a huge handful of parmesan cheese, pesto adds more green color and replaces some of that cheese with arguably more preferable olive oil (healthy fats!). 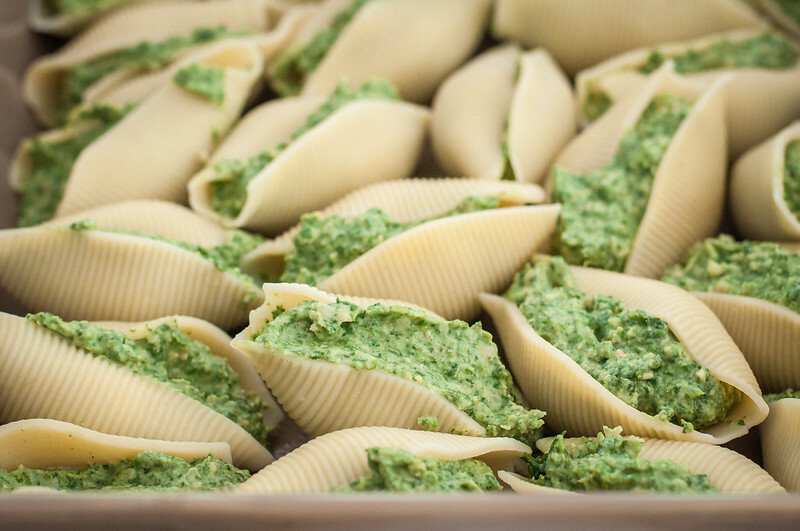 Pesto is such a magical ingredient in dinners. You can make it yourself, with any herbs and nuts you have on hand (expensive pine nots are not required), or buy some at the grocery store, which has often been made fresh on site, so it’s basically like you made it? Either way, you swap four or five items on an ingredient list for just ONE. I think that’s what they call a dinner win. 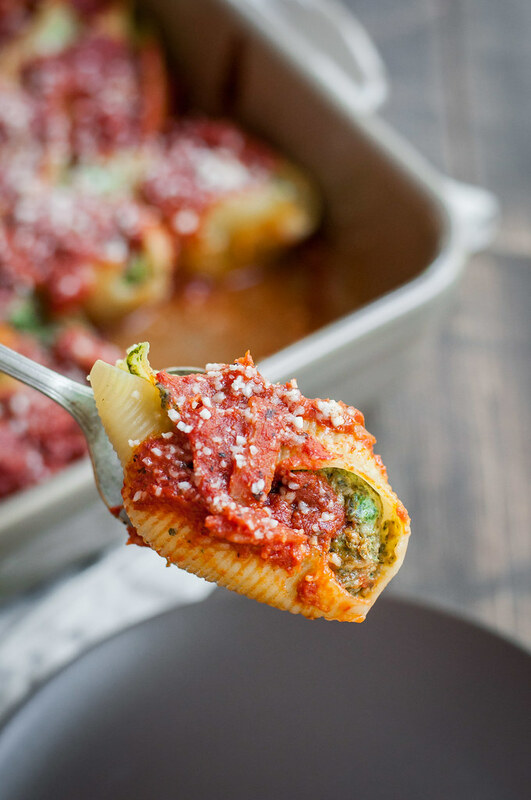 The recipe for these stuffed shells is adapted from one of my favorite dinner idea sources, the NYT cooking app. Their recipes can be a little involved (justifiably so, because the results are spectacular), but I streamlined it as much as I could. Frozen spinach saves you trimming and chopping fresh greens, and, like I said before, the pesto stands in for lots of grating cheese and chopping herbs. If you have homemade marinara in the freezer, it will shine in this recipe, but to be honest, I grabbed a decent jar of organic sauce and I’m not sure even your Italian grandmother would be the wiser. Boiling and stuffing the shells does require a bit of cookware and patience, but the recipe serves at least six, justifying the effort, I think. If you really want to make it worth your while, double the recipe and freeze extras in dinner size, oven-safe pans. I would (and did) bake them before freezing because raw frozen egg freaks me out. Finally, to really speed things along, and avoid cleaning the food processor, you can just stir all the filling ingredients together in a bowl, using a potato masher to crush those beans. The only downside is you won’t get such a uniformly green, pretty filling. Bring at least 5 quarts of water to a boil in a large pot (or work in two smaller batches). Add a tablespoon of salt, a splash of olive oil, and the shells. Boil about 9 minutes (or until very al dente), stirring occasionally to keep the shells separated. Gently drain the shells in a colander, or scoop from the water with a slotted spoon. Rinse briefly with cool water. Line a rimmed baking sheet with plastic wrap. When the shells are cool enough to handle, separate them by hand, dumping out additional water and placing opening up in a single layer on the sheet pan. Cover with more plastic wrap once almost cool. Bring a few quarts of water (or use remaining pasta water, if you didn't dump it out) to a boil in the same pot. Add frozen spinach and cook three minutes on high, until tender. Line the colander with damp paper towels if the holes are large, then drain the spinach. Set colander over a bowl to drain more while you start the filling. Add just the garlic to a food processor and run until it's finely chopped and sticking to the sides. Scrape down the sides of the bowl, then add the ricotta, eggs, beans, pesto, 1½ teaspoons salt, and several grinds of pepper (a big pinch). 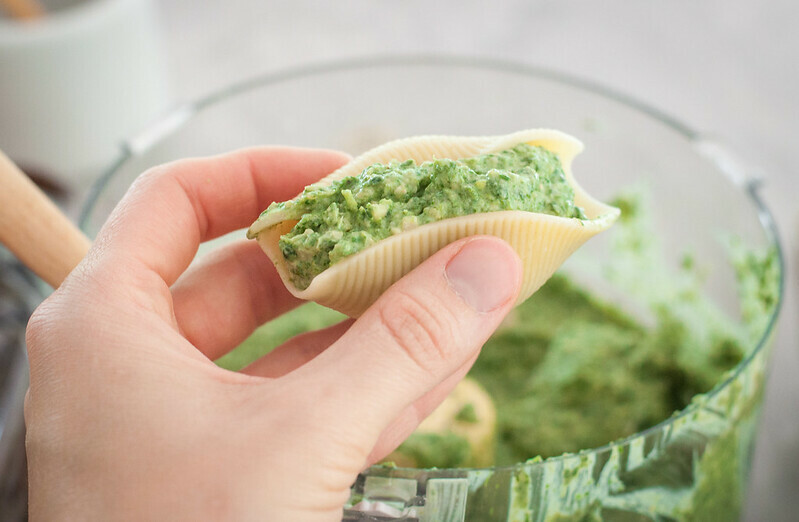 Squeeze the spinach in your hands to drain well of remaining water, then add to the other ingredients in the food processor. Run until almost smooth, with a few small bits of spinach still visible. I prefer not to taste after adding the raw egg, but if you find it necessary taste a little and adjust seasoning to taste. Preheat the oven to 350 (F) and spray or lightly oil a 9 x 13" pan, plus another smaller casserole dish (about 8 to 10 of the shells won't fit in the 9 x 13). To fill the shells, pick up one shell at a time, holding it open with thumb and pointer finger of your non-dominant hand. Scoop 3 to 4 tablespoons filling with your other hand and scrape into the shell. Most of them won't look perfect, which is okay! Place filled shells close together in the prepared pans. Spoon sauce over the shells, leaving bits of the green filling visible. Cover pans with foil and bake for 30 minutes. Increase heat to 375 (F), sprinkle shells with some grated parmesan (if using), and bake uncovered for another 5 to 10 minutes until cheese is melted and excess moisture is reduced. Cool 5 to 10 minutes, then serve alone or with a crispy salad on the side! If you like LOTS of sauce, heat up another cup or two and serve at the table with the shells. I don't recommend adding it before baking, as it will cover up that pretty filling and also produce excess moisture in the dish. I had trouble finding jumbo shells in several grocery stores. Use the link in the ingredient list to order them on Amazon, if need be. Note: This page contains affiliate links. It does NOT contain sponsored content. 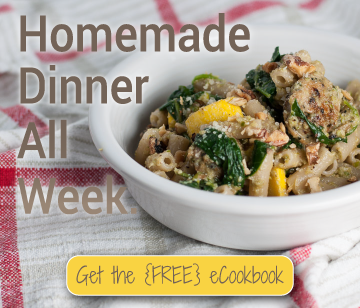 Affiliate links (to products I recommend, on Amazon) offset my ingredient and website maintenance costs, so I can keep bringing you cozy recipes like this one. Thanks!